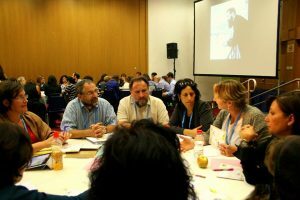 Where the Jewish Agency gathers Jewish leaders from around the world for deep consideration of the pressing issues of the Jewish People. Makom designs and facilitates a day dedicated to moving beyond the communal headlines to examine the deep issues that drive them. At the GJF International Jewish leaders deliberately does not take decisions, but together decides to deliberate… Young committed adults sit around the table with institutional leaders, sharing perspectives and gaining understanding. Rabbi Bennett Miller, Chair of the Association of Reform Zionists of America (ARZA) and Senior Rabbi at Anshe Emeth Memorial Temple in New Brunswick, NJ. What’s going on with our kids? Rabbi Oren J. Hayon is the Greenstein Family Executive Director at the Hillel Foundation for Jewish Life at the University of Washington. Jerusalem has been a-popping with assemblies and conferences. The Assembly of the Jewish Agency for Israel overlapped with the General Assembly of Jewish Federations (GA), which fed into the Board of Governors of the Jewish Agency… A real party! 1. We were surprised that non-Israelis were surprised that Israelis are engaged on meaningful journeys of Jewish Identity. 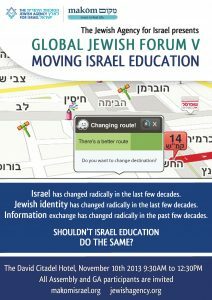 “You will have seen that the publicity design for this Global Jewish Forum on Israel Education is based on the format of Waze. Waze is an Israeli hi-tech invention recently bought by Google for over a billion dollars. It’s a mobile application that works as a sophisticated GPS navigator. You key in your destination. It immediately recognizes where you are. It maps the fastest route for you to reach your destination – but not only by looking at the map. It also gathers information from all the other users of Waze at that moment, so as to gain an up-to-date picture of where there are traffic hold-ups – and it alters your route accordingly. 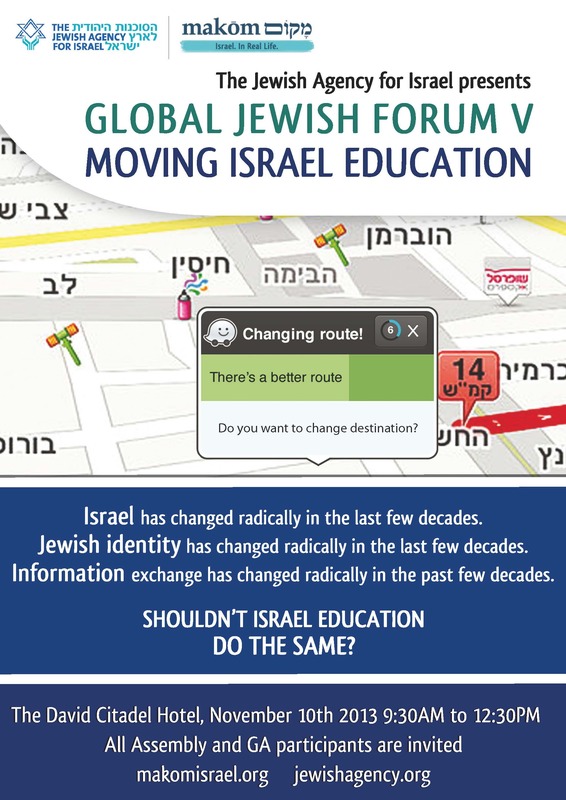 Today’s Global Jewish Forum, designed by Makom, the Jewish Agency’s Israel Education Lab, is built on the same principle as Waze. When looking at Israel Education throughout the world – where are we? What is our starting position? Where would we like to get to? It’s no good hoping to get somewhere while keying in a different place altogether. And finally, what are the obstacles in the way of our reaching our destination, and how can they be avoided or overcome? Just as with Waze, this final question of obstacles can only be answered through the shared information and shared perspectives of everyone else out on the highways and byways of Jewish life. This morning we’ll be gathering a picture of where we’re at from Dr Alex Pomson, we’ll have the chance to share our ideas of destinations and obstacles in small group discussions, and then we’ll get the chance to hear some key practitioners working through their journeys.